Text: At a ¼ past 8 we went with Lehzen, Lady Conroy, and Sir John to the play to Convent Garden. We came in for the last scene of Gustavus, the Masqued Ball, and stayed the whole of the pantomine, which is called “Old Mother Hubbard and her Dog; or Harlequin and Tales of the Nursery”. The scenery was very pretty and the principal characters were; Venus, Miss Lee; Cupid, Miss Poole, who appeared in three other dresses: as a peasant boy, as a drummer, and as Mother Hubbard, and she looked very pretty and acted very well indeed. Old Mother Hubbard, Mr. Wieland; Schock (her dog), Master W. Mitchinson. The Duchess Griffinwinkle Blowsabella (afterwards Pantaloon), Mr. Barnes. King Rundytundy O, (afterwards Dandy Lover), Mr. W.H. Payne. The Princes Graciosa (afterwards Columbine), a very pretty person, Miss Foster. Prince Percineth (afterwards Harlequin), Mr. Ellar. Head Cook (afterwards Clown), Mr. T. Matthews. The panorama at the end was also pretty. We came home at a ¼ past 12. I was very much amused. Comments: Alexandrina Victoria (1819-1901), later just Victoria, was Queen of the United Kingdom of Great Britain and Ireland from 1837 to her death, and additionally titled Empress of India from 1876. She kept up a journal from 1832 until almost the end of her life. The journal records many visits to the theatre, particularly in her younger days. 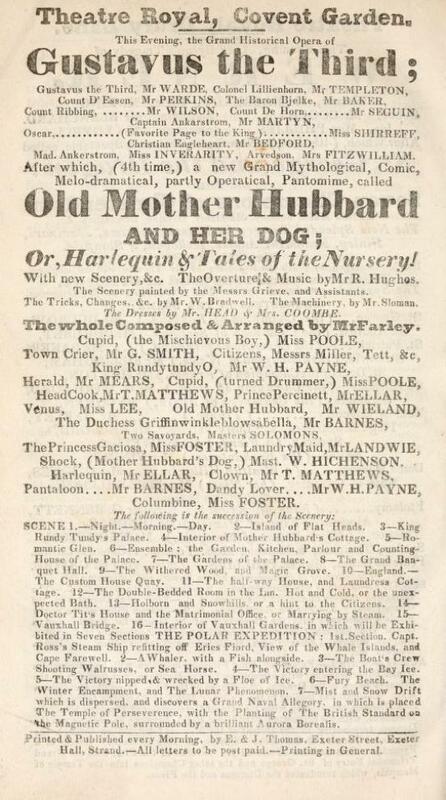 On this visit to Covent Garden she saw the last scene of Daniel Auber‘s recently written grand opera Gustave III, ou Le bal masqué and Old Mother Hubbard and her Dog, a pantomime composed and engineered by Charles Farley.